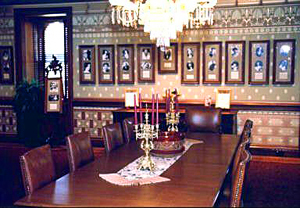 The ballroom was used often, since the Saxtons were among the city's most prominent families. At one masquerade ball, Ida dressed up as the Queen of Hearts and won the costume contest. 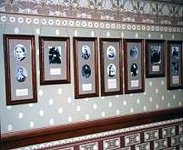 Today the ballroom houses the 90-picture collection of First Ladies' photos. The photos are from a remarkable collection of first ladies' photos owned by Craig Schermer, the foremost collector of first ladies artifacts in the nation. 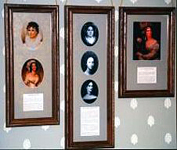 The pictures begin with Martha Washington and run counterclockwise, featuring all the first ladies. The captions are written by Edith Mayo, the former curator of the first ladies exhibits at the Smithsonian. 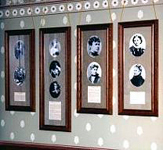 There are also several display cases containing letters, books, and other artifacts from various first ladies. 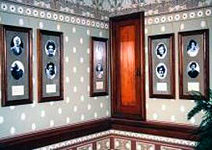 The ballroom features a hand-blocked stencil-type historic design that sets off the incredible First Ladies display.